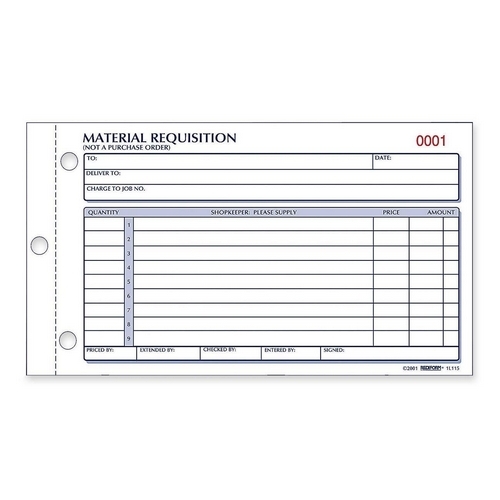 Manifold book with flexible cover contains two-part carbonless forms for material requisition up to nine items. Two-part paper sequence features originals in white and duplicates in yellow. 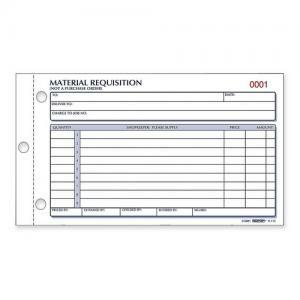 Each form has the clarifying notation, "Not a Purchase Order" before "Material Requisition" to avoid any confusion. Design includes spaces for request recipient, item recipient, job number, date, vital process details ("priced by," "extended by, "checked by," "entered by") and signature. The ruled list of nine items includes boxes for quantity, item description, price and cost amount. Requisition forms are consecutively numbered. 50 sets per book.